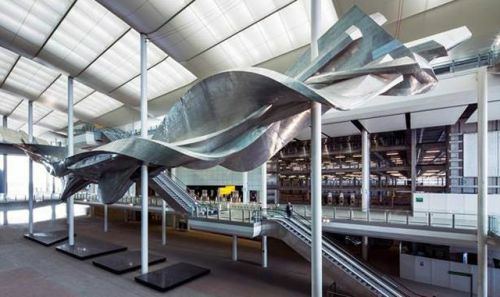 Heathrow Airport in London has unveiled the star art attraction at its revamped Terminal 2. “Slipstream” is an aluminum sculpture inspired by the areal maneuvers of a stunt plane. Created by British artist Richard Wilson, the piece weighs seventy-seven tons and measures seventy-eight meters in length. The sculpture will get the royal approval when the Queen officially opens the terminal on June 23rd. 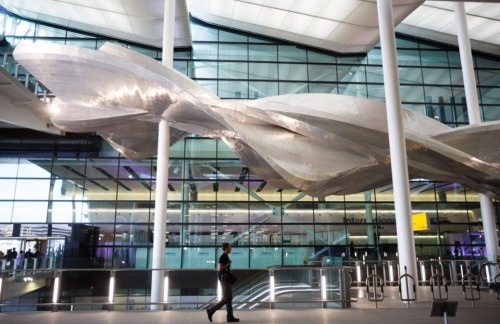 Curated by public arts agency Futurecity, the work is expected to be seen by 20 million passengers a year, making it one of the most viewed pieces of art in the country. Read more at the BBC. "Slipstream is inspired by the exhilarating potential of flight, coupled with the physical aesthetics of aircraft. Constructed in aluminium, the piece aimed to solidify the twisting velocity of a stunt plane manoeuvring through the volume of the new terminal."